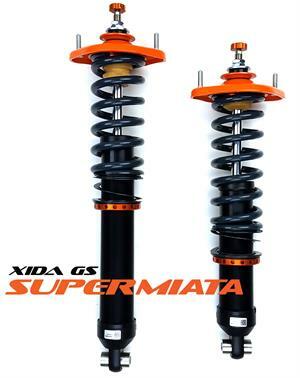 The “Gran Sport” Xida uses the longer XL shock and is a single variant with no customizable options, 550/350 rates only. When used with a longer main spring and near zero rate tender spring, we are able omit the expensive dual spring system and torrington bearings and still retain sufficient droop travel and deliver market leading dual-purpose ride quality and handling. The Xida GS comes fully assembled and ready to bolt in, or you can ommit our assembly and delete the NB mounts. You will need to supply your own NB shock mounts. With the near OEM length of the Xida GS, the available ride height range is roughly 5.25” to 6.5” pinch weld. From moderatly lowered, up to just below OEM height. We recommend the sweet spot around 5.75" pinch weld. At these taller ride heights, the Xida GS will provide the best ride quality with stock sway bars but still have excellent roll control. Yes this seems odd but the suspension geometry changes significantly by running above 5.5" pinch weld, much greater inherent roll stiffness. Try it first before spending money on aftermarket sway bars. Xida GS are just the ticket for maximum multipurpose value, with great day-to-day ride quality and more practical ride heights. You still get great backroad handling and enough springrate for good performance during occasional track or autocross use. Save some expense by leaving off all the motorsports grade options of the normal Xida Race or Xida XL system but can still add them later if you go for a more competition focused setup. Fully assembled with new Supermiata NB style top mounts.